Cookie mugs are used by people across the globe to drink their cookie shake or mix their cookies right. If you want a good and sturdy cookie mug, Giftwrap offers one that you can choose to get 1 to full color printing on. The cookie mug is made out of ceramic and it has a cut out for cookie as well. Overall it is great in design and style and therefore can be used for a range of purposes, whether in homes or offices. Holding a cookie in the hand while you sip away your coffee, is frustrating and irritating. We don't like doing it because it makes the whole part of dunking the cookie in the coffee a hassle we would rather avoid. With these cups make your morning coffee more fun. If you are sitting in a meeting or casually having your morning coffee at home, this mug will be useful in every situation. You can always make the cup customized with your brand's logo. 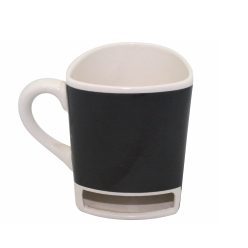 The built-in cookie hole in the mug by Giftwrap will make sure that you never again would have to hold the cookie while you have your coffee, milk, or tea.